As one of the first known sub-Saharan Africans to study at a European university, the freed slave Jacobus Capitein became a celebrity in Holland for his academic and religious achievements and later returned to his homeland to evangelize the indigenous population. Capitein was born on the Gold Cost but his exact place and date of birth are unknown. According to his own account, he was kidnapped from his parents at the age of seven or eight and sold to Dutch sea-captain named Arnold Steenhard who gave him as a present to his friend the merchant Jacob van Gogh. Capitein lived with his master for two years in the Dutch Fort of Elmina in Ghana before leaving with him for Holland in 1728. With his entry into The Netherlands, Capitein won his freedom since slavery at that time was officially banned. He moved with his guardian to The Hague where he learned Dutch and after one year was able to attend the catechism class of the local Reformed Church where he was later baptized. Very early in his education he announced his desire to become a missionary in Africa. Being an excellent student, Capitein obtained the support of Van Gogh and other guardians to pay for his higher education and finally begin his studies in theology at the University of Leiden in 1737. For the next four years, Capitein pursued his studies, expanding his knowledge in Latin, Greek and Hebrew and becoming one of the best students of his faculty. His dissertation on slavery and Christian liberty (as not being opposed to each other) was presented in 1742 and gained him widespread attention and appreciation among theologians and slave traders. Having finished his studies, Capitein soon became the first black minister of the Reformed Church and in the same year boarded a ship to return to Africa. Immediately after his arrival in Elmina in October 1742, Capitein took up his missionary work. He tried to revive a religious school for mulatto children that had been started by the Dutch and translated religious texts into Fanti. But his work was hampered by setbacks and personal defeats stemming from the lack of support by the West Indian Trading Company and his church Classis in Holland. Embittered and in debt, Capitein died on 1st February 1747, aged about 30. Allison Blakely, Blacks in the Dutch World: The Evolution of Racial Imagery in a Modern Society (Bloomington: Indiana UP, 1993); David Nii Anum Kpobi, Mission in Chains: The Life, Theology and Ministry of the Ex-Slave Jacobus E.J. 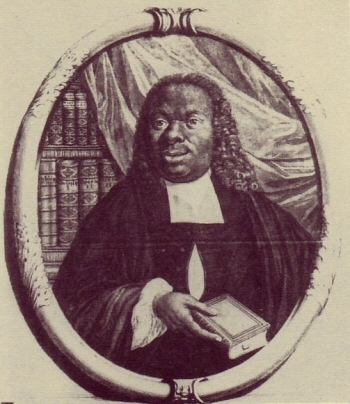 Capitein (1717-1747) with a Translation of his Major Publications (Zoetermeer: Uitgeverij Boekencentrum, 1993); William J. Simmons, Men of Mark: Eminent, Progressive and Rising (New York: Arno Press, 1968).